so here it is in time for the weekend. 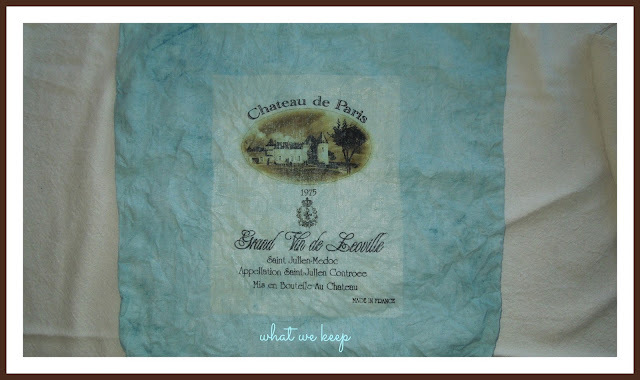 This time I used Aubusson Blue and a linen pillowcase that had an iron on transfer. It's been washed several times and then became Bruce's, so it's a good candidate. I wasn't sure if the dye would take over the transfer. I mixed my paint/water in a juice container. You don't need measurements here, seriously. It's like playing with watercolors- keep playing with it until you love it. Put the lid on tightly and shake it, baby. If you are a scare baby, go back to 'the recipe' of 1 part paint to 20 parts water. (Was anyone reminded of the Baldwin sisters on Walton's Mountain just now? Ah, my mind does wander. let it sit for a minute, then flipped it over and covered it with more. It's less messy to do it that way, especially for small pieces. Make sure your bowl or container is large enough to avoid spills. The larger things will be done in a tub outside. It does NOT stain my white sink. I love how the linen grabs the color. This soaked for 20 minutes. After wringing it out, I laid it out in the sun for 30 minutes. It felt kind of stiff, so I threw it in the dryer for 5 minutes. Are you loving the way it deposits so unevenly? I am. 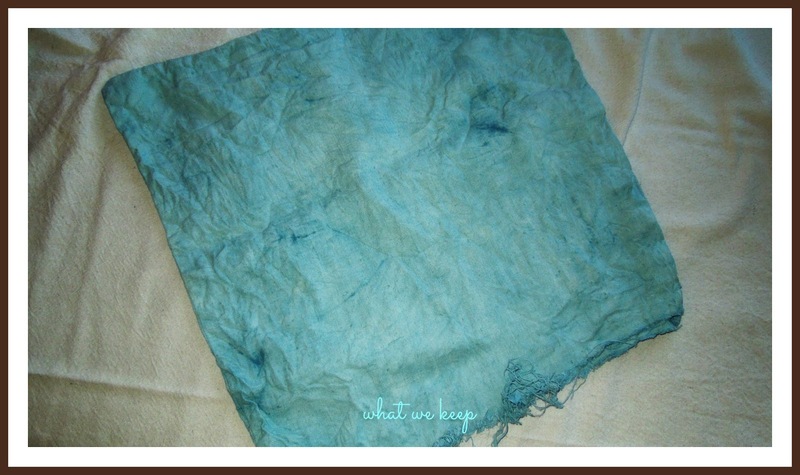 Remember that natural and untreated fabrics work best. I have some drapes that I might try next. They've been sitting in a cabinet forever, so why not? so I'm definitely not finished playing yet. I poured my potion back into the juice bottle to reuse tomorrow. The color sinks to the bottom of your container, so stir before re-use. and threw in some white towels to see if the paint would bleed. I threw them in the dryer and they came out soft and with no fading. I'll be wearing that tee shirt and maybe wearing Sophie's babushka, too. I realize that ASCP is almost $40 a quart. You may be thinking that this is an expensive way of dyeing fabric. But really, it took so little paint! I have so many different types of fabrics that I'll try some samples this weekend. Add a little Graphite to darken, add a little Old White to lighten. 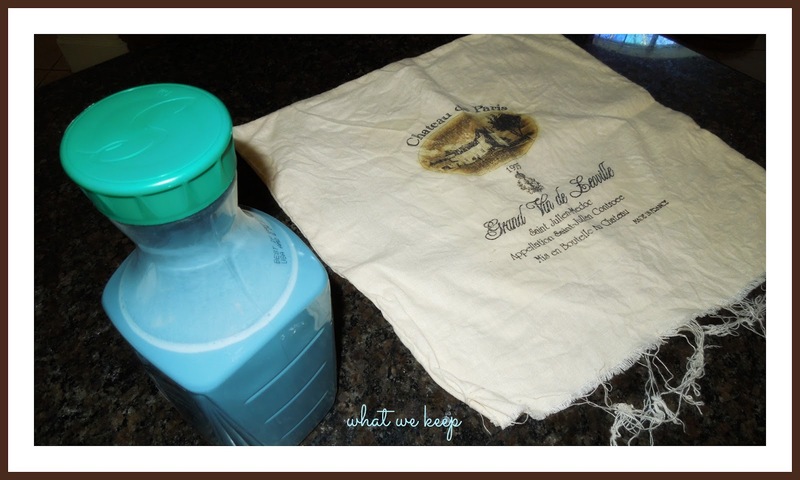 Go make your own potion! Can we see Bruce modeling this, babushka style a la Sophie?! Wow! You are having some serious fun with this! They should be sending you free paint. Turned out just gorgeous! Thanks for being the guinea pig for us scare babies!! Maybe the secret is in dog drool for this item? You can model your new clothes for April's TICT, it's about what we wore like around the house. Or moonshine from the mountain. Scare baby #2 keeping a close eye on this and lovin' it!! Thanks for sharing your science experiments with us! You know I can't even do spongepaint, but I still want to comment! I love seeing you do all the trial and error on this, only I'm not seeing the error. Looks like a fun way to make a colorful change. Thanks for the idea! Your a crazy genius!!! I would have never, never thought to try this, girl! Interesting! Adding this to my list of projects to try. The pillow cover turned out so cute. I will have to remember the "recipe". I have only light colors ASCP but I loved reading about your experiments.